Do you want to align with God’s heart in prayer over the earth? If so, while you are praying for yourself, your family, and your nation, remember also to pray for Israel and pray for the peace of Jerusalem. The Jewish people are the apple of God’s eye. If you don’t know this–and know that we Christians are grafted into God’s original covenant with Abraham–then PLEASE, run, don’t walk, to watch Finding Deep Soul Healing 102, because Scripture says there is a curse on your life until you’re in proper agreement with God about Israel. But the Jewish people need to be saved. They need to accept Jesus–Yeshua–as their Savior and Messiah–and it’s the goodness of God that brings men to repentance (Romans 2:4). So, we are commanded to pray for Israel; to pray for the Jewish people; and to pray for the peace of Jerusalem. I was glad when they said to me, ‘Let us go into the house of the Lord.’ Our feet have been standing within your gates, O Jerusalem! Jerusalem is built as a city that is compact together, where the tribes go up, the tribes of the Lord, to the Testimony of Israel, to give thanks to the name of the Lord. For thrones are set there for judgment, the thrones of the house of David. For the sake of my brethren and companions, I will now say, ‘Peace be within you.’ Because of the house of the Lord our God I will seek your good” (Psalm 122:1-9). 1) Because God loves Jerusalem. 2) Because the Temple was there and will be there again, according to Bible prophecy. It’s the place God historically set His glory. 3) Because it’s the eternal, undivided capital of the Jewish people, and God loves the Jewish people. 4) Because God said to. So will you join me in praying for this land God loves? “Father God, I come before You in Jesus’ name. Father, thank You for sending Your Son Jesus to die on the cross for me. Thank You for grafting me in to the covenant You made with Abraham, and thank You for saving me, blessing me, and filling me with Your Spirit. Father God, I want to identify with Your heart and pray Your will. And Abba, I know that it is not Your will that any should perish, but that all should come to repentance. Just as You saved me from eternal damnation by the blood of Your precious Son, You desire that Your people the Jews should also come to saving knowledge of Jesus Christ as their Messiah. So Father, first and foremost, I ask You to visit the Jewish people with visions of Christ. Show them that Jesus is the Messiah, Yeshua, the Savior foretold by the prophets. Show them that He is the fulfillment of the Law and the Prophets. Show them that He is Your Son, Christ the Anointed One, both God and resurrected Man. Show them Your plan of salvation through faith in Christ alone. And Father, help them believe. Show them the resurrected Christ–the Man in white–and let their knees bow and tongues confess that Jesus Christ is Lord, to the glory of God the Father. Holy Father, bring Your people back to Yourself. Now, Father, I also pray for the peace of Jerusalem. Protect her airspace from attacks from any source. Protect her roadways and bridges. Protect her Prime Minister and all government personnel. Protect her food and water sources. 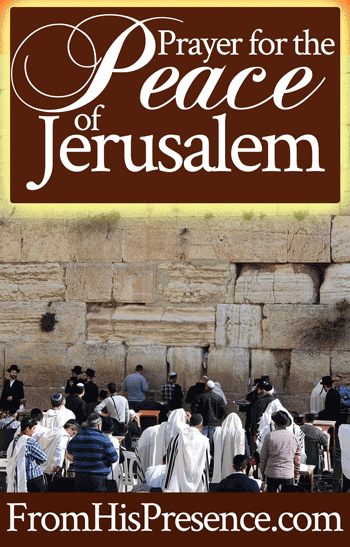 Protect the Wailing Wall and other historical sites that are important to the Jewish people. Protect her interests at home and abroad, especially in the United Nations. Contend with those who contend with her. Bless those who bless her. Protect her economy, Father, and the Tel Aviv Stock Exchange. Protect the foreign embassies on her soil, Lord, and protect Israel’s embassies on foreign soil. Protect her governing body, the Knesset. Protect her intelligence networks, Lord, and the security of her staff both at home and abroad. Father God, for the sake of the house of the Lord my God, I pray for the peace of Jerusalem. Let every enemy assignment against Israel and the Jewish people be cut off right now in Jesus’ name. Let every plot and trick of the enemy be exposed. Send angels to defend Israel and the Jewish people wherever they are on the earth. That You would end abortion in Israel. Father God, give Your people wisdom and discernment to know right from wrong. Let them separate the holy from the profane. I pray that You would guide them in all of their affairs, from the humblest home to the highest level of government. Father, I pray also for the reconstruction of the Temple in Jerusalem. Because Your Word says it will be rebuilt, I pray that You would provide for the time, the place, the materials, the political situations, and everything else for it to be done. When the Temple is rebuilt, Father, I pray that it would bring glory to Your name. Because the Law pointed to Jesus, I pray that this rebuilt Temple would be a symbol that shouts the name of Your Son Jesus across the globe. Even though its builders don’t intend for it to proclaim the name of Jesus, Father, use the Temple to preach the Gospel into the heart of every Jew and Gentile on the face of the earth. Let the very stones cry out the name of Jesus. Let the stones, mortar, and every Temple instrument proclaim that Jesus is the Holy and Anointed One, the Christ, the Son of the Living God. Father, I pray for the peace of Jerusalem. Protect these people who are the desire of Your heart. Bring them back to You. Let them wander from Your covenant no longer. Let them accept Jesus Christ as their Messiah, and bring peace to both Jerusalem and to every other city in Israel. God, protect Your people. Prosper them. And bless me also, for I have blessed the children of Abraham by lifting them up to You. Friend, I encourage you to print this prayer out (using the printer icon at the top of the page, in the social sharing box) and keep it with you. Add to it, pray it, and intercede for God’s covenant people. Pray for them to be saved, and pray for the peace of Jerusalem. Will you join with me to lift up the children of Abraham to Father God and ask Him to bless them and draw them to Himself? If so, leave a comment below! I pray every word of the prayer for the peace of Jerusalem! I am blessed to discover through DNA testing that my brother and I are 3 % Jewish! I am thrilled by this. You will arise and have mercy on Zion; For the time to favor her, Yes, the set time, has come. For Your servants take pleasure in her stones, And show favor to her dust. Thank you. indeed may God bless Israel and the Jewish people and every Jew all over the world. This is so beautiful!! The Lord has placed this on my heart and also about things to come in Israel and i believe now more than ever we as the body of christ needs to answer his call and pray for them.